We first met bride-to-be Sharlie when she was a guest at one of the weddings we organised on the Spanish coast. She had always dreamed of getting married in Spain after having had such a great time at her friend’s big day, so we were over the moon when she contacted us to see if we would like to plan her wedding to fiancé Ollie. At Sunshine Weddings Spain we love nothing more than bringing together different cultures and customs for one special day, which was why planning Sharlie and Ollie’s wedding was so unique as she wanted to include her Jewish traditions whilst Ollie’s family gave proceeding a touch of Cypriot wedding tradition too. Most of our couples have a rough idea of what kind of wedding venue they are looking for in the South of Spain, and Sharlie and Ollie were no exception. They knew they wanted a Marbella beach wedding with a touch of luxury…and we knew some of the best places in the area to show them around. 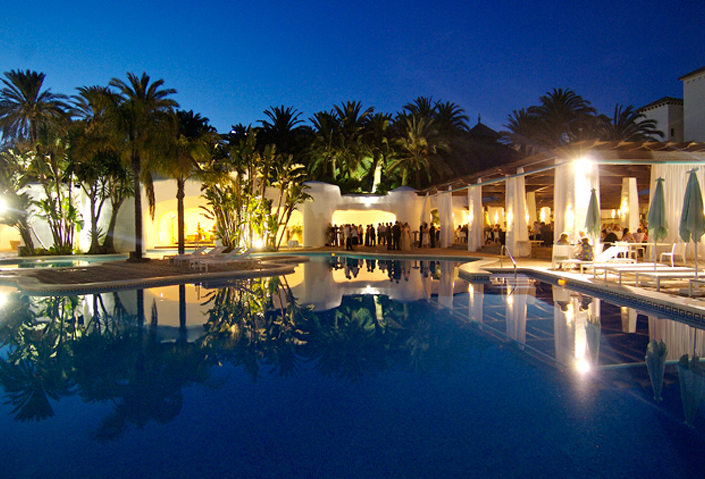 The Andalucian coast is full of breathtaking hotels, bars and venues overlooking the sea, but when we arrived at this Marbella Beach Club they knew straight away that they had found their dream venue. The venue is a favourite amongst our couples as it provides a magnificent pool taking president in the centre of the entrance with the sparkling azure sea in the distance, plus a vast outdoor dining area with room inside for dancing…providing our couple with the perfect space for their special day. Styling and decoration was really important to Sharlie and she was really lucky to have her mother and future mother in law helping her with her vision. She wanted classical decor in an ‘all white’ theme, and our florists and stylists were completely on board to make her dreams a reality. Finally the wedding week arrived. Guests flew into Malaga and we arranged a fun get together at a restaurant on the Marbella Golden Mile where all of Sharlie and Ollie’s loved ones could get to know each other over some informal canapés and drinks. Then the day was finally upon us…. In Part Two discover the beauty of our Marbella beach wedding venue and why the sunset hour was so magical and special for our special couple.